In cooperation with AG Globale Verantwortung, Global Compact Network Austria, and the Austrian Economic Chambers (WKO), the Ban Ki-moon Centre for Global Citizens co-organized an open dialogue event “Innovative Business Cases for a Sustainable Future” at the WKO in Vienna, Austria on January 23rd. 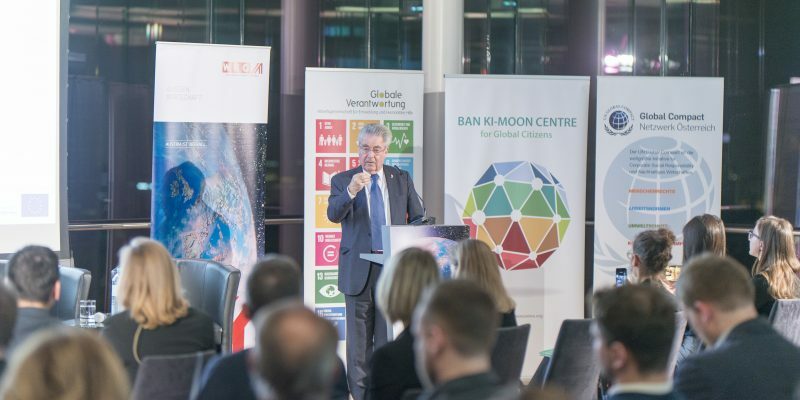 Following the opening remark of Vice President Ulrike Rabmer-Koller of WKO, BKMC Co-chair Heinz Fischer delivered a keynote, emphasizing the importance of the cooperation in achieving the SDGs. “When we commit ourselves to implementing the SDGs, we make a significant contribution to effectively and sustainably fighting these risks,” said Fischer. The audience also actively participated in the discussion, and three best practices of Austrian enterprises were presented with the story walls.